This card is one that I'm swapping at SU Convention! Can't wait to see what the other demonstrators have created with the new Bella Rose designer paper! I'm so excited! I wanted to let my blog readers know that I will be away at Stampin' Up! Convention in Salt Lake City until Sunday. I have scheduled blog postings for the rest of the week, so check back to see my convention swaps! I look forward to sharing more with you next week! Here is a 3D project that my blog friend, Martha, shared with me. You can visit her blog here to get the directions and to see more of her awesome projects! Thanks for sharing, Martha! Cutting a 12 x 12 sheet of cardstock will give you a totally different look and measurement for your card base. First, align a 12 x 12 sheet of cardstock (NEW Kiwi Kiss shown)at the 6" mark. Cut. Here is the result of the first cut. Next, align one of the pieces of cardstock horizontally at the 6" mark again. Cut again. This is the result of the second cut. Then, align a piece of cardstock at the 3" mark. Score. Here is a Splitcoaststampers Featured Stamper Challenge card that I made today using all NEW SU products (except the ice rhinestone brads)! This shows a slightly different way to cut cardstock for a standard medium sized card base. First, align a sheet of 8 1/2 X 11 sheet of cardstock (NEW pink pirouette shown) vertically at the 4 1/4 mark on the paper cutter. Cut. This is the result of the first cut. Next, align one of the pieces of cut cardstock at the 5 1/2 mark. Score. This is a card that I'm going to demonstrate at a home workshop this afternoon. Using the same materials with few measuring differences, you can create a 6X6 scrapbook page instead. A couple of my customers were needing the measurements for cutting a standard medium (5 1/2 x 4 1/4) greeting card so I thought this would be a perfect time for me to try me tutorial skills on this blog. First, you align your 8 1/2 X 11 sheet of cardstock (new Baja Breeze shown here) horizontally at the 5 1/2 mark on your cutter. Cut. This is the result of that first cut. Next, take one of those 5 1/2 X 11 pieces of cardstock and align it horizontally at the 4 1/4 mark. Score. Hope this helps! Check back later for a different cutting tutorial! Here is the result of our Bali Breeze Stamp Camp, designed by Andrea Walford. Aren't these cards gorgeous? Our metal tins did not arrive in time, but we will be completing them at a later time. Stay tuned for the result! Thanks ladies! I had a great time stamping with you! But, we missed you, Paula! Here's another challenge, limited supplies challenge, from Splitcoaststamper! When I got back from getting my hair cut today, the babysitter was eager to try some stamping. I was thrilled to get her started! 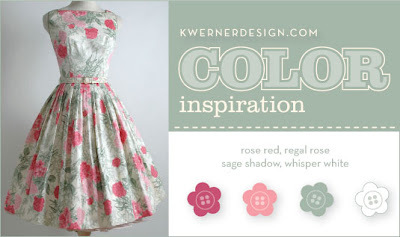 She wanted pink and brown and liked the KWerner Color Inspiration card I made earlier this week. This 6X6 scrapbook page is what we came up with. Isn't it wonderful? Great job, Halie! Here's another Splitcoaststampers challenge, sketch challenge #186. It's hard to believe in just a just a few short weeks, SU is retiring the current In Color palette! I'm excited about the new In Colors, but Groovy Guava has been such a refreshing color! Here's my color challenge submission for the week on Splitcoaststampers! A friend asked me for a set of thank you cards and this is what I came up with. A set of six hand-crafted cards (three different designs) and envelopes are available for $15.